& the evening, dying, is dread & chill. Who is dreaming a clear labyrinth. Nor by the timorous love of maidens. Map of That which totals His stars. This is of course more than an honorary poem, it is a meditation, and a meditation by one of the greater literary/philosophical minds of the century. What is most remarkable about it is the way that Borges bridges the historic Spinoza to the Infinite Spinoza, through the act of lens grinding. Spinoza, in the very materiality of his act, the grinding of a hard, difficult crystal, somehow escapes history, yet in a personal sense. It is a paradox, and Borges, the lover of paradoxes, grasps this nexus point with tremendous subtlety. It would seem that Spinoza would ultimately agree with the notion that his Ethics was a vast diamond(s), a tremendous lens which he worked on for over decade. He would enjoy the idea that the work itself is a materiality, (his ontology demands it), a materiality which we too use, in combination with our own materiality. This is a physicality of idea that necessitates mutuality. I am not sure, but I believe that Borges wrote this sonnet when he was losing his vision, what would seem like a terrible loss. Here, the evening falls, and the hands become even more physical, and even less confined. If Spinoza argues for a liberation, it would seem to be a liberation which understands freedom to be the most material of things, and his Ethics to be material construction. The internal paradoxes of such an aim, the clarity of its labyrinth, are the things which make it possible. I liked your comment on Borges and Spinoza. I would also like to add that the concept of carving the diamonds is a reference, of course, to Spinoza’s “more geometrica”, with his conception of God as a somewhat mathematical being (taken from Descartes, and pushed to new limits by Spinoza). Moreover, Borges, who was not known for writing poetry in traditional meters, chose a sonnet, which adds a structural dimension to his fascination with Spinoza’s philosophy of symmetry. Good blog. 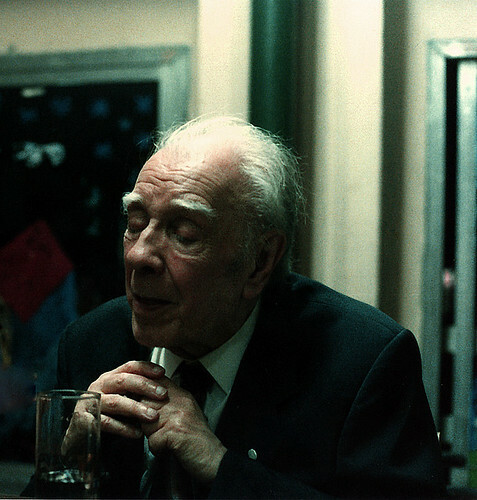 But yes, the form of Borges’s sonnet does add to the contrast between austere form and lived life. Nice. Good to know about the reference of Spinoza as a lens grinder. It goes to show that there are many references that one may not know about, but are there for us to discover. Additionally, I am sure you are correct when you point out Borges’ possible reference to the fact that Spinoza was a Jew, as this is a recurring theme throughout his works, and one that has been widely studied and written about. There are even those who have accused Borges of holding antisemitic feelings. I am personally not that familiar with Spinoza, but I certainly like philosophy and theology, and will read the “Spinoza’s foci” link. I am, however, more well versed in Borges, and I can confirm that while he wrote sonnets and used other classical meters on occasion, most of his poetry was written without meter or a particular rhyme pattern. His poems do rhyme sometimes, but not always (at least in Spanish). Moreover, he wrote much more poetry than people suspect – it’s just that he is more well known for his short stories, and that’s what most people read. Additionally, many of his poems are written in a semi-prose style, contributing to the confusion. In any event, I thank you for posting an answer to my comment. I like your blog and I will try to read it with some regularity. Best regards. I hope you find the “Spinoza’s Foci” worthwhile. As much of this weblog has been devoted to, there is something distinctly missing from the historical Spinoza picture when his lens grinding and microscope/telescope instrument making is forgotten. And I appreciate the notes on Borges. Very interesting post, and a very good translation, indeed. The reference of Spinoza or Espinosa (en español) as a lens grinder shouldn´t be a mere curiositty. According to the latest biographies (see Cambridge Companion)Epinosa built no only lens but telescopes in order to see the sky. He actually kept contact with some astronomers. Glad you’re enjoying the series of posts. And yes, we are fortunate the Borges followed his own lights.